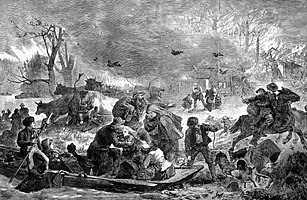 The October 8, 1871 Peshtigo Fire which is thought to have begun in Peshtigo, Wisconsin, killed more people than any other fire in America's history. With as many as 2,500 dead and 1.2 million acres of land burned, the Peshtigo fire should have seared a permanent memory into America's consciousness. But the less severe "Great Chicago Fire" occurred on the same day, and has since overshadowed the "forgotten fire" of Peshtigo. (National Fire Protection Week in October was created to memorialize the Chicago fire.) Although no direct cause was ever conclusively determined, prolonged drought and high temperatures in the Upper Midwest led to fire-prone conditions. Additionally, the introduction of extensive farming, logging and industrial practices in the area made for large clearings and increased the likelihood of sparks. Whatever the cause, much of Wisconsin and Upper Michigan were engulfed in firestorms  a fire that is so strong it creates its own wind system and becomes a tornado-like column. At one point the roaring blaze reportedly jumped several miles over the waters of Green Bay. See photos of the Arizona wildfires.